Better Homes and Gardens posted an article about Easy to Grow Orchids. It was mentioned by the author that the orchids mentioned are easy to grow. Let’s evaluate the instructions given to grow these orchids and see if they match up with usual standards for growing orchids. The moth orchid reportedly needs low, medium, or bright light in order to grow. Most orchids like a good deal of sunlight, but not usually 100% sunlight (though a few species of orchids do). Most orchids also can go for long periods without water as long as you water them thoroughly where their mediums are moist (but NOT soggy) when you do water them. Arguably, the most controversial piece of advice is the mention of using fertilizer monthly to promote larger blooms. Others argue that you should not fertilize unless your plant calls for it (there are physical signs that your orchid is in distress and needing it) and it’s not a good idea while flowering UNLESS you have the exact mixture. On this point, the author is correct – you need to have a fertilizer that is formulated for orchids. This is critically important to your orchid’s ability to flower properly and even to survive. Therefore, the author provides valuable and accurate information, but it should be noted that the fertilizer MUST be the proper fertilizer for orchids, and specifically moth orchids; using another fertilizer could ruin its blooming capabilities and even its life. The author also advocates fertilizing dendrobium orchids monthly with a fertilizer that is made for dendrobium orchids. Again, this goes against others who say that your orchids only need to have fertilizer sparingly, only when they call for it and not on a monthly basis. Most suggest that you should only give fertilizer once a year at most. The author is correct in that the fertilizer needs to be specifically tailored to dendrobium orchids, but again, it should be emphasized that only that type of fertilizer should do; no substitutes are allowed unless you want to risk the reproductive capabilities and lifespan of your orchid in the process of fertilizing it incorrectly. One other point that may be controversial when it comes to the author’s advice is the temperature range given for many of these easy-to-grow orchids. The author suggests 50-75 degrees Fahrenheit. Many others would suggest not letting the temperature get below 50 degrees Fahrenheit, so suggesting 50 degrees as an appropriate temperature is a little controversial, being that there are orchids that can die if the temperature reaches below 50 degrees Fahrenheit, so you are likely to be better off keeping the temperature significantly above 50 degrees Fahrenheit (at least 55 degrees Fahrenheit) to ensure you have a barrier against falling temperatures – otherwise, your orchid could die. What do you think? Please submit a comment below. 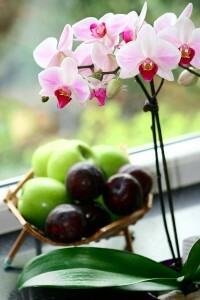 For more information about the moth orchid, here is information on Phalaenopsis Orchid Care.